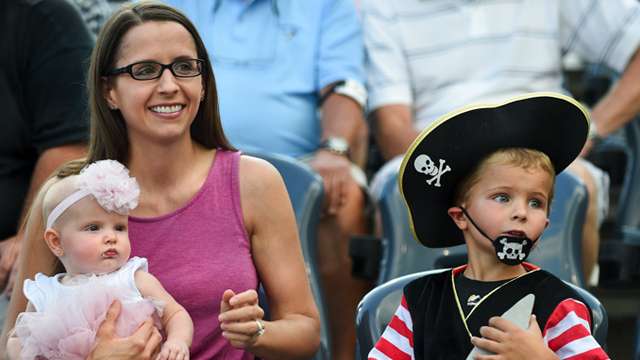 The West Virginia Black Bears have announced their 2018 promotional event schedule, presenting another fun, affordable, family entertainment experience for the summer at Monongalia County Ballpark. Granville, WV- The West Virginia Black Bears have announced their 2018 promotional event schedule, presenting another fun, affordable, family entertainment experience for the summer at Monongalia County Ballpark. With an agenda full of awesome giveaways and lively theme nights, there is something for fans of all ages to enjoy this season. The entertainment begins on Opening Day, Thursday, June 21st at 7:05pm against the State College Spikes as the WV Black Bears team up with WVU Medicine for a cap giveaway. The first 1,000 fans will receive the giveaway item, with the gates opening at 6pm. Single game tickets for all 2018 WV Black Bears home games will be available May 1st for purchase at westvirginiablackbears.com. Highlights of promotional schedule include Friday Nights' Fireworks, Jersey Auction Nights, Bobblehead Giveaways, and much more! Friday Fireworks will help fans kick-off the weekend with a bang! Turning their attention to right field at the end of the game, each show will light up the summer night's sky. There will also be special firework shows on Saturday, June 23rd in honor of West Virginia Day, as well as Wednesday, July 4th in honor of Independence Day. During the 2018 season, the WV Black Bears will have seven opportunities for fans to come and enjoy the firework displays on their home turf. Another fan favorite returning this summer will be the Jersey Auction Nights! There will be a total of five themed jersey auction nights. Themes will include Stepping Stones Jersey Auction (June 30th), American Heart Association Jersey Auction (July 7th), Star Wars Jersey Auction (July 28th), Military Appreciation-Operation Welcome Home Jersey Auction (August 11th) and Superhero-American Cancer Society Jersey Auction (August 18th). Bobblehead Night presented by Mylan will be on Thursday, July 26th. This year's bobblehead will be a WV Black Bears replica of Pittsburgh Pirates 2015 1st Round Draft Pick and former WV Black Bears infielder Kevin Newman . The first 1,000 fans will receive the giveaway when gates open at 6pm. Xpogo is set to make their debut at Monongalia County Ballpark on Tuesday August 7th. Showing off their extreme pogo stick tricks for all fans in attendance. The 2018 Meet the Team night will be on August 12th. Fans will be able to stick around after the game for autographs with all of their favorite players. On August 20th the Team Photo Giveaway will be for the first 1,000 fans. Wednesday, August 22nd, fans may bring their pup to the park for a $5 donation. Proceeds from the dog entries will go to the Hearts of Gold program. Dog tickets may be purchased online or at the box office. Also returning for their third season Thursday, July 19th will be Ladies' Night. 75 spots are open for the pregame Paint' N Sip Party hosted by the WOW Factory! Participants will receive a complimentary glass of wine and a ticket to the game following the festivity. Ladies' night will also be a part of the three-game WV Moonshiners themed series. For a complete view of this year's promotional schedule and to purchase ticket packs or season ticket please visit westvirginiablackbears.com or call 304.293.7653.